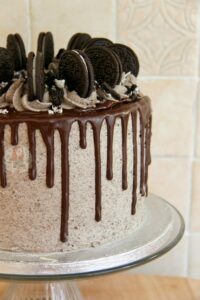 A 3-layer Chocolate Cake, with Oreo Buttercream, a Chocolate Drip, and Even More Oreos Make a Delectable & Showstopping Oreo Drip Cake! One of my Dad’s work colleagues had their last day recently, and I wanted to bake something special as they have been one of my taste testers, and she’s so lovely… so I went for a Drip Cake. Admittedly I did make the cake and have written a blog post about it, but I can’t afford to not to post this when it was so damn delicious! I didn’t actually get to eat the cake, but I had a few spoonfuls of the buttercream whilst decorating as you know, they accidentally fell into my mouth, but the lucky lady and the rest of my Dad’s Colleagues said it was divine! 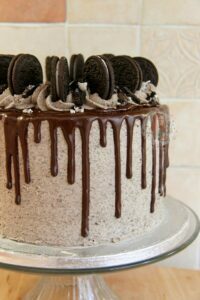 I’ve been wanting to do another Oreo recipe in a while, so doing a Drip Cake was ideal. I used the same Buttercream recipe from my Oreo Cupcakes which I posted ages ago, yet have always used. I decided to use about 300g of butter for the buttercream, and then 650g of icing sugar. Adding in the entire packet of crushed Oreo’s made it the perfect amount to fill the cake, decorate the cake, and pipe on top of the cake! I used the same idea for the cake from my Salted Caramel Drip Cake, just using less Self-Raising Flour, and adding in some cocoa powder to make it chocolatey. I adored making this cake. I found using the Oreo Buttercream easier to cover the sides for some reason (not entirely sure why!). And then making it all drippy and delicious was heavenly. I’m surprised I didn’t eat some of it myself, but I resisted to make sure it look better… But anyway, any questions then message me on Facebook, or comment below! Enjoy! In a stand mixer, beat together the butter and light brown sugar until light and fluffy. Add in the flour, cocoa powder, beaten eggs, baking powder and beat again briefly till combined – try not to over beat the mixture! If its really thick, mix in the whole milk to loosen. In a stand mixer, beat the room temperature butter with an electric mixer until it is smooth and loose and then beat in the icing sugar 1/3 at a time until its fully combined. Keep beating the buttercream for a few minutes so it starts to get fluffier and lighter. In a food processor, blitz the packet of Oreo’s to a fine crumb, and add into the buttercream. Beat the buttercream again till smooth, and use the Milk to loosen it to a smooth consistency. Once the cakes are cooled, put the first layer on the serving plate spread some of the buttercream onto the top of the first layer, add the second cake on top, and then top again with some of buttercream and then add the final sponge layer. Only use about 2 tbsps of buttercream per layer so that you have enough to decorate with! With the leftover buttercream, as you can see, I covered the sides (and top) too! Do a first layer of around the edge and top using a large metal scraper and refrigerate for 10 minutes. Repeat again with a slightly thicker layer of buttercream. I slather it on all over using an off -set spatula, and then run the metal scraper round until its smooth. 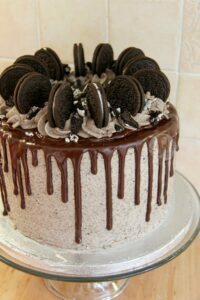 If the Oreo’s were blitzed to a really fine crumb like you need, the buttercream can still be smooth around the edges even though there is biscuit in the mix! Once finished, melt the dark chocolate in a heat proof bowl until melted. Add in 1tbsp of oil and beat till smooth, continue to add oil till you get to a drippy consistency. I used 1+1/2 tbsps total. Using disposable piping bags, pipe it round the edge of the cake, edging over slight bits to create the drip. You don’t need to use too much per drip as it’ll drop quite far down by itself! Fill in the top in with the rest of the chocolate so the top is also covered. Refrigerate the cake for about 15 minutes. Using some left over buttercream, pipe little rosettes of buttercream onto the top and add a whole oreo – sprinkle on some crushed oreos and huzzah! You’re done! Enjoy! You obviously don’t have to make straight edged buttercream if you don’t want to, but I just like the look of it! You can slather it on, and it’ll still taste damn delicious. However, if you do want to make it like this, I seriously recommend using a metal scraper for the decoration of the buttercream, and the disposable piping bags.. I wouldn’t be anywhere without them! And it might take an extra 5-10 minutes to bake and use 2/3 of the decoration recipes! 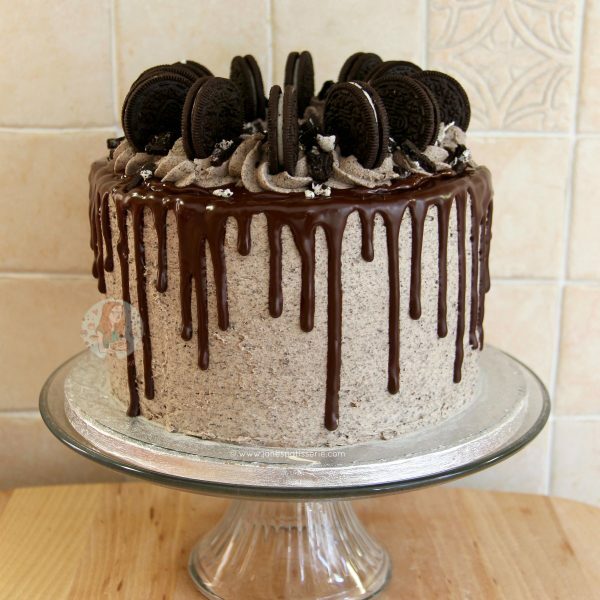 Find my other Cake & Oreo Recipes on my Recipes Page! Older Next post: Biscoff Rocky Road! Newer Previous post: M&M Cookie Bars! The light brown sugar mentioned, is it light muscovado sugar or brown caster sugar? It’s light brown soft sugar! I was hoping to make an Easter cake , so could I replace the Oreos for mini eggs or would that not work ? Have a look at my Easter Cakes for inspiration – I wouldn’t advise putting mini eggs into the buttercream when making a drip cake! Hi, could I increase this recipe by 25% to make a 9” instead? How many large eggs 8? Hi just a quick question can this be made into a tray bake? Love this cake I have made it a few times always goes down well. I’m sure it can be! 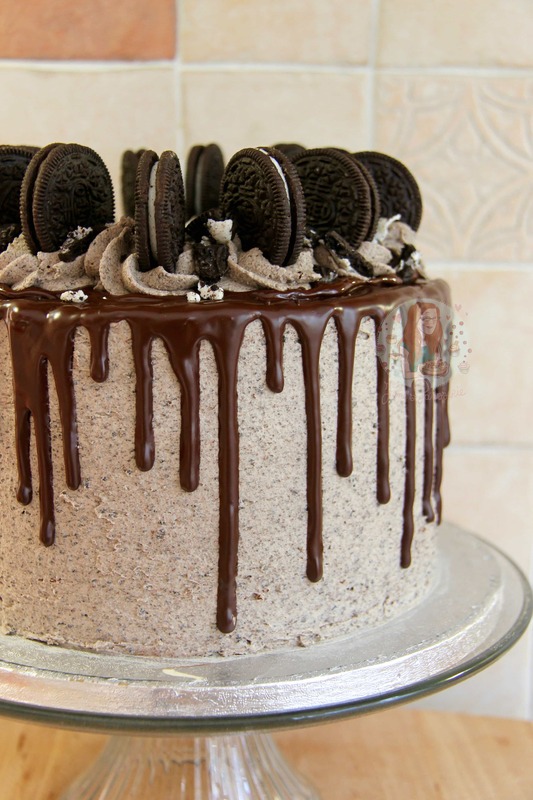 I haven’t personally however – but an Oreo traybake would be scrumptious. Hiya! I’m not 100% sure what you mean.. but the cake recipe as is is for an 8″/20cm cake, and for a 10″/26cm cake I would use 1.6x the recipe. Each tier will have three layers then, so it will be huge! Hi would this work with a milk chocolate drip? If so how much oil would you recommend I use? I use the cake recipe lots, thank you! Hi, what size/type of piping nozzle did you use for the rosettes on top of the cake please? I believe this was a Wilton 1M nozzle! I had actually already ordered the Wilton 1M nozzle before you replied after having looked into the best ones for swirls! Made this for my boyfriend’s birthday and it was perfect!! This is an awesome cake 💗made for my Oreo loving sons 12th birthday and it was just perfect. Thanks for providing not only a fool proof recipe but all your tips and tricks. The kids are still talking g about it weeks later. Hi I am so excited to try this bake but I too was going to do a Vanilla sponge instead of chocolate. I read that i need to add the flour up to 400g but do I also need to swap the light brown sugar to normal caster sugar, or do i keep the light brown sugar? What is icing sugar? I am trying to get the ingredients today to make but I’ve never heard this term before. Are you able to do this cake with a vanilla cake base instead of using cocoa powder? If do what would I substitute the cocoa powder for? Leave out the cocoa powder, and up the flour to 400g. Thank you, would crushed oreos work well in the cake batter it’s self? Seriously yumm!!! Made this for my sons first birthday and was a winner with everyone! Can I use white chocolate with oil for the drip instead of dark choc? Thanks! Hi. 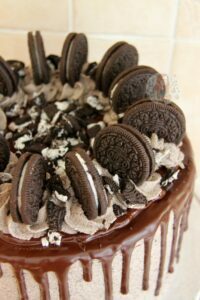 I am making this as a 16th birthday cake and will be delivering the day before the birthday. I am worried about the Oreo’s going soft. Have you ever dipped/ brushed half of the biscuits in chocolate (the part that will sit in buttercream)? Wondering if this might prevent them going soft. Any thoughts please? Hiya! Yes they do go a bit soft, but I usually just roll with it. You probably could to be honest! It might delay it a bit further, but they’d probably go soft eventually anyway due to being out of the packet. But, dipping half in chocolate might just make it more delicious so go ahead! Hi Jane! I am planning to bake this cake this week, but I will be using a 7″ deep PME tin, how long would you advise to bake the mixture for? I would like to make it for 30 people but I can’t make it too tall what should I do. Make it in larger tins? Do you think this cake would be nice as a Victoria sponge cake, rather than a chocolate cake? Want to make this for my husbands birthday, and he prefers a Victoria sponge. Thanks. Yep that would work well!! Hi! I’m excited to try this out. I’m making it for a birthday tomorrow. Lots of people will be there so I’m really nervous about getting it right. Lol. Just a quick question, is it possible for me to bake the cake and leave it in an air tight container and decorate it the next day? I won’t have enough time to do it in one day. Oh my word! I made this cake at the weekend and wow! It is amazing, birthday mostly I impress myself being able to make it! Thankyou Jane! I’m going to try your lemon and blueberry cake at the weekend. It will be ok with Stork won’t it? My daughter loves cakes but unfortunately, recently has developed a dairy allergy 😞. I made your salted caramel drip cake for my daughter’s birthday, it was amazing and much admired! Many thanks! 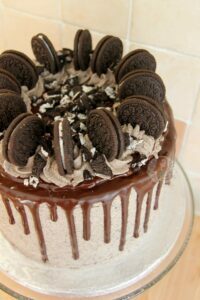 Am making the Oreo cake for my bro in law tomorrow and wondered if I could add some caramel condensed milk to the icing as I loved that flavour or would it change the colour of the butter cream. You could add some caramel to the buttercream but it might make it slightly more golden! Thank you! I may add it to the filling! 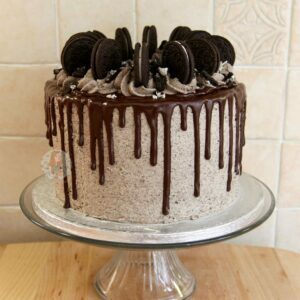 The Oreo cake was a great success, many thanks! My bro-in-law loved it as did everyone at the party. I managed to get a gold cake topper and tall gold candles. It looked superb. I currently have my sponges in the oven at the minute, im making this cake for my sister in laws birthday! Im so excited! Just worried about doing the drip as i want it too look as good as yours lol and ive not done it before so dont want the chocolate to look as if ive just poured it on haha. Love your recipes by the way. How do you transport the cake to your dad’s office? Didnt the frosting get melted during the journey? And how do I keep the cake fresh and moist during the transport? Hiya! No, if you use a cake box transporting will be fine. I’m wanting to bake this tomorrow but i’m worried that it wont fit into any container I have. What is the approx height of the cake? Sorry this is a bit late – but probably about 6 inches or more depending on how high your sponges come out! Hi Jane, can you freeze the sponges? Hi Jane! I’m planning to make this cake for my brother’s birthday. I need help though as I don’t have any self raising flour available, only all purpose flour. How could i substitute? Thanks for your help!!! Hiya! Are you in the US? Do you have cake flour? Just made this for my son’s 18th birthday – complete success – thanks so much for the fab recipe! What if I can’t fit all 3 cakes on the same shelf? Do you have a fan oven? I’ve made this cake about five time it is always a winner!!! I’ve just came on here to get the chocolate drip recipe as found your one of using oil set far better than cream. I’m currently making a kinder drip cake using your recipe and must say that buttercream is the best ever!!!! I made this for my boyfriends birthday and it tasted amazing! the only thing was the buttercream was incredibly sticky so when i applied it to the cake, it was taking parts of the cake off. and idea what could have gone wrong for next time? Most likely your Buttercream was too thick still as it should glide on easier than that. Try adding in 1-2tbsps of boiling water and beating so it’s really smooth. It’s also easier to use a large tool to help spread it on to prevent a problem. Hi, I was wondering if you had tried this frosting with golden Oreos instead of chocolate Oreos? I’dm thinking of trying this with a a vanilla sponge. Thanks in advance. Have a look at my custard cream cake for an idea – if does work in the same way, and would work for this! The Buttercream does tend to look lumpy though rather than like Oreo buttercream. I have found that my chocolate drip often starts to bloom after a few days which doesn’t look very pretty. How would I stop this from happening? Do you mean the chocolate turns white? That’s down to the sugar crystals in the chocolate usually being melted too harshly. Try melting slower, and more gently perhaps? Often depends on brand of chocolate as well. I’m afraid I can’t as I find cup measurements really unreliable. It’s worth googling the converts. Hi, I would like to know how much of the ingredients I would need in order to make this cake to serve 10 people. I would use the same amount or make the smaller version thats noted in the Tips and Ideas section. Of course. bake the mixture into two tins, and split each cake in half. or increase the mixture for another layer. a very tempting cake, may I try on the weekend? I’m wanting to make a drip cake for my Mum’s birthday, i wanted to make it a white choc drip rather than dark, would this still work the same with the oil? Also if you use a turntable how do you get your cake from the turntable to a cake board or whatever? As others have said your recipes are fab and so easy to follow. I made your Rolo cheesecake a couple of weeks ago! Yum! Hi, just wondering if it would be ok if I used demerera sugar instead of brown. I know it will change a bit but will it be a huge difference? It shouldn’t change it too much – but the flavour and texture might change as you say! I just tried posting a comment and not sure if it went through. Curious about storing the cake, my niece and I are making it for her birthday on Saturday (however, the party isn’t till Tuesday). If we don’t put the buttercream swirls/oreo’s on top will the cake keep until Tuesday? I’m concerned about leaving things with milk/egg on the counter for 3 days. Buttercream is fine at room temperature on cakes for up to 5-6 days usually (but I usually say 4 days max) as real butter doesn’t have to be kept in the fridge anyway, but especially once combined with sugar, its fine. Once a cake is baked, thats also fine to keep out. You could make it all on the Saturday if you wished, but I would recommend using a sugar syrup on the sponges to keep it moist for that long. I would leave the biscuits off the top of the cake as they will go soft in those 3 days. You will need to store it in a cake box/container as well. My niece wants to make this cake with me for her birthday and just curious about how to keep it as we’re making on Saturday and the party is on Tuesday. If we put the chocolate on top but leave the buttercream swirls and oreos until Tuesday will it keep ok on the counter? I’m just a bit concerned about leaving things with milk and egg on the counter for 3 days? I just made this, came out fab!! So grateful for the recipe! It’s getting collected tomorrow, do I leave in the fridge overnight? I don’t have a container big enough for it! Nooo not the fridge, it’ll dry the cake out. hi Jane – will it be ok to leave it out on kitchen top under room temperature with heating on for winter? Yep! Room temperature (out of the fridge) is best! When icing the cake, do you use a cake turntable along with the wilton icing smoother? or can you just use the icing smoother without the turntable? I do usually use a turntable as it’s easier, but sometimes I don’t ? Wanted to ask how moist is the sponge? Would you moisten the layers with syrup or something or does it not need it? If you wanted a more guaranteed moist cake it wouldn’t hurt it to use the syrup. I often use syrup when it’s hot as the cake can dry out quite quickly depending on how you store it for example. It’s hard to say as your opinion of a suitable cake might be different to mine if that makes sense? What syrup would you use to make the sponge moist? Probably 150ml water with 150g caster sugar dissolved together and cooled would be enough for the 3 layers. 300g worth like the other ingredients ? Hey, I want to give this recipe a trial run I’m just gonna halve it to make one smaller cake will this work?! Also on going to my cupboard I’m out of light brown sugar…will caster be ok? I guess will just make it less rich?! Hi I’m in the UK. Is the flour plain or self raising please? Thanks it looks amazing!! Ah amazing! I hope you love it! Hi Jane. Just made this cake for my daughters 15th birthday and I loved making it, your instructions and tips are brilliant and made this an enjoyable bake. My buttercream is way darker than yours though.. just curious why? Cake still looks amazing !!! It might be that your Oreos were in smaller pieces than mine so coloured it more? But I’m glad you loved it! Hi there! Want to make this recipes but wondering if you have a metric version for the ingredients? Thank you! Hiya – sorry I only work in grams, but you can find conversion scales online! I would recommend investing in a set of digital kitchen scales though! I’m thinking about making this cake for a friends birthday however I struggling with making buttercream firm enough. Last time I made a drip cake the buttercream swirls on top began to melt and slide off a little. I will also have to travel with the cake for an hour and a half so want it to keep looking pretty. Hiya! It might be that the ganache is what made the buttercream swirls move slightly if it wasn’t set enough before you piped them on top? I was doing a search for an oreo recipe frosting and yours looked great. I made it on the weekend (doubled the recipe and with lots left over that can be used for cupcakes) to cover a 10″ cake it was an absolute hit, so delicious! Love the recipe, thank you. Awh thats amazing! I am so glad!! Hey 🙂 Do I have to seperate the cream from the oreos before I blitz the oreos? I love all your recipes! I’m making the Oreo cake for my nephews birthday but im covering it with fondant! I need to do a 9in round for I have to set a krispie volcano and dinosaurs on it what would be the ingredients for a 9in or would it be easier just to double your 8in recipe. Hi Jane! I want to use the oreo buttercream to fill a rainbow layer cake with at least four or five cakes. I would like to know how to increase the ingredients so it’ll be enough for the whole cake. Thank you and greats from Buenos Aires, Argentina! You could maybe double the buttercream and just have some leftover so that you definitely have enough? Use the leftover for some cupcakes or something! Just wanted to say what a brilliant recipe this is! I’ve never baked before but wanted to give this a try for a birthday. Your recipe was so easy to follow and I never felt overwhelmed with the instructions. I wish I could show you a picture. I look forward to trying another recipe soon. Awh thats absolutely amazing! ❤️ I am so glad that you liked the recipe and it was a success! Thank you! Hi Jane, this looks amazing, can’t wait to make it!? Do you use sandwich tins or deeper cake tins?